Tina! 50th Anniversary Tour was a concert tour by Tina Turner, her first concert tour in eight years, since her record-breaking Twenty Four Seven Tour. Turner made the announcement on the Oprah Winfrey Show in late April 2008. She visited many countries throughout Europe and North America. Tina Turner states her inspiration for creating the tour was the success of her performance with Beyoncé Knowles at the 50th Annual Grammy Awards. Tina Turner's North American tour proved to be a huge success selling out every date and grossing US$47.7 million dollars. Her European tour has become the 2nd highest grossing tour worldwide, grossing US$83.5 million in just 52 shows. Bringing its estimated total gross to over US$130 million dollars. “ A brand new stage show that will feature hit after hit spanning Tina Turner’s entire career, with a spectacular production including the singer’s top-notch band, innovative choreography, hi-tech lighting and much more. (...) The set, the production, the songs, and Tina Turner’s unique stage presence will delight her legions of fans who have followed the legendary diva’s extraordinary creative journey, while seducing new admirers and proving that her vocal majesty still continues its reign to this day. The stage design was by Mark Fisher with lighting by Baz Halpin, and video by Olivier Goulet. 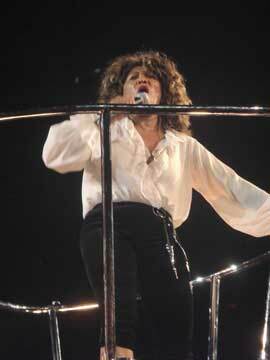 It included elements created by Fisher for Tina Turner's previous tours, including the Goldeneye Iris from her 1996 tour and the claw from her 2000 tour. Tina Turner's tour proved to be successful in 2008, selling out all her North American dates. Many critics praised the tour, citing, "this woman defies so much conventional wisdom that being in her presence for two-plus hours is a bit of a head trip". David Wild of Rolling Stone magazine wrote, "[...] last night was proof positive that the former Anna Mae Bullock still deserves our R-E-S-P-E-C-T. By the [end of the night] the Queen had already touched her royal subjects the old fashioned way — nice and rough." According to Pollstar, Tina's European tour, which, according to them, grossed $83.5 million for only 52 of the 53 shows and played to 686,021 European fans in the span of four months. Making it one of the years's biggest tours thus far. Accoring to Billboard.com the tour grossed in 2009 $86,372,137 of 47 Sell out shows, making it the 9th biggest tour of the year. At the end over 1,000,000 people saw the Tour. 1 Oct. 2008 - Sprint Center - Kansas City - USA -18000 - S.O. 3 Oct. 2008 - United Center - Chicago - USA- 18000 - S.O. 4 Oct. 2008 - United Center- Chicago - USA - 18000 - S.O. More about this tour on my forum! !